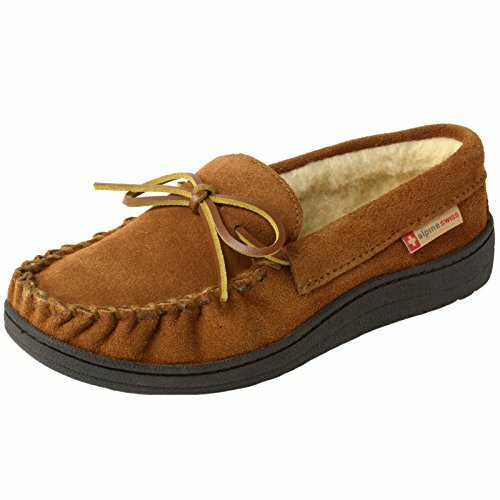 Sabine Women's Suede Slippers By Alpine Swiss Let these comfortable moccasin slippers be your new favorite house shoes! They also make the prefect holiday gift! Product Features: Genuine Suede Slip-on, moc-toe design Faux shearling lining Medium width Designed to wear with thin or no socks Rubber outsole made for light outside use Padded Insoles for added comfort MSRP: $38.00 Alpine Swiss donates 2500 meals every day to hungry children in the U.S. and around the world through our partnership with Children’s Hunger Fund. These meals are hand delivered in a Food Pack, which will contain enough food to feed a family of 4-5 for a week to the homes of the needy by trained volunteers in their community, establishing relationships that foster genuine care. Your purchase fuels this effort! Thank you!